Kombucha Fuel: Experiment #1: Grow Your Own Kombucha Mother! Apparently you can grow your own SCOBY?!?! See the video. This is helpful if you don't know someone with a kombucha mushroom, or if you don't want to pay $20+ ordering one online. I never tried this before, but I followed the typical Kombucha recipe, sans the mushroom. If you are trying to grow a mushroom, they recommend using raw, un-pasteurized kombucha, such as GT's, as your starter tea. Hopefully, the little strands of culture in my starter tea will help create a new SCOBY. We'll see in a week or two if the drink ferments, or if a new mushroom forms! So, how is it working? Is your store-bought kombucha growing a Scoby growing yet? 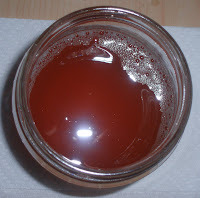 i have not tried growing my own kombucha mushroom from store-bought kombucha yet- but as you can see from my more recent posts, growing my own SCOBY turned out very well when I used my own home-brewed kombucha as starter tea! Can you drink the tea you grow your mother in? you can totally drink the tea you grow your mother in! depending on how long it took to grow your mother, however, you may or may not want to drink it. the longer the ferment, the more acidic the tea will become. if the tea is very acidic, I would recommend using some as strong starter tea, and maybe diluting the acidic tea when you drink it.